I would like to present my recent work - TFC Progressive Pack ver. 1.53 - extension of technology, transportation and weaponry beyond TerraFirmaCraft lifespan. no ore duplicates, TFC ores and items are a core of the modpack, other mods uses TFC resources extensively. credits: TimbuckTato, Funwayguy et al. Due to compatibility reasons, two type of bottles are available, vanilla and TFC, which are craftable each into other. In case of multiplayer game, remove Dynamic Lights and Damage Indicators mod from server side. If you want to ignite cannon spraying machine, you need "vanilla" Flint&Steel made from steel ingot. IE Metal Press can be also used for any metal bucket production and hammering pig iron into steel - but other red and blue tools/weapons need non-automated anvil works. Only TFC, IHL and Metamod ores are generated, IE Excavator dig out TFC resources. Aluminum can be obtained from bauxite conglomerate (obtained by crushing bauxite) dissolved in NaOH and dehydrated to Al2O3, finally by arc furnace with cryolite additive, aluminum nuggets can be melted in inductive furnace. Refined gold, nickel plated steel and permalloy ingots can be produced in Inductive Furnace or by electroplating. 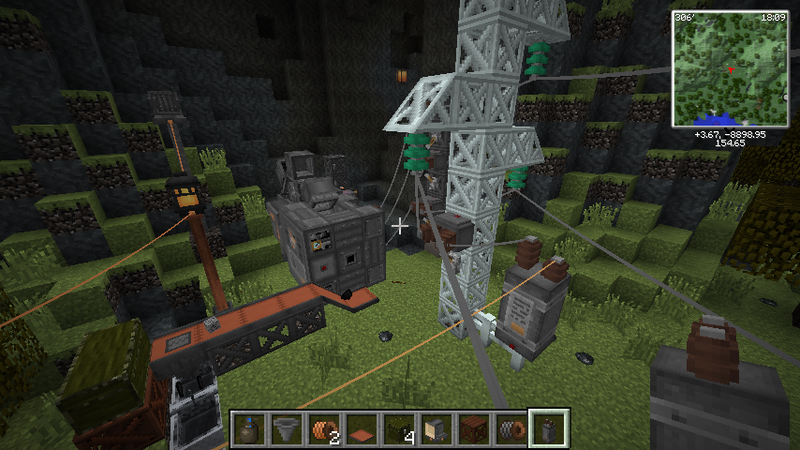 Item transport can be achieved by Railcraft carts or IE conveyor belts. Flintlock muskets, revolver and railgun firepower are balanced for TFC environment. Advanced weapons need some unique parts. To avoid compatibility problems with cuchaz ships, there is limited number of block which can be used for ship assembly. Generally, only vanilla wood blocks, oil treated planks, metal slabs/cubes and railcraft glasses and lamps can be used for ships. Vanilla logs can be created by soaking some TFC logs in olive oil. Just use impregnated wood stuff. Rubber logs also count in. Also thatch can be used for ship/raft construction. Mobs difficulty and its drop value is depth dependent. Burning mobs can cause fire or produce pile of waste. Surface mobs are usually neutral, except of weekly zombie/skeletons raids depending on moon phase. Maximal span of bridge or other construction depend on block type, single lane of cheap/easy to make block (thatch, wooden planks etc) can be extended to a few blocks, expensive/hard to make blocks (bricks, treated wood, concrete) can be extended much more, IC2 solidified foam is not affected by physics. 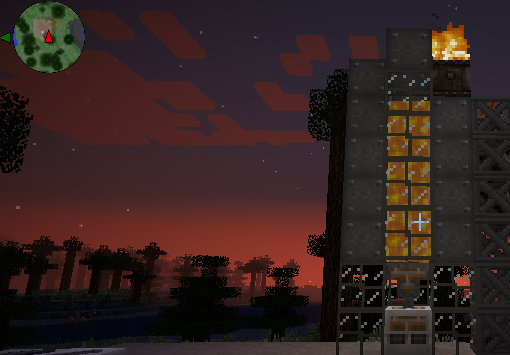 Fire (torches, firepits, forges, lit furnaces, some engines) pollute air, you will suffocate in enclosed room. Make chimney/shaft opened to the sky or use respirator/leaf block/saplings to improve air quality. Long exposure to the monsters in darkness have impact on your sanity, you can improve it using alcoholic beverages or lemonade. Please do not hesitate to point me any bugs or problems. Modpack contain readme file with all mods author credits listed, hope that I met all license stuff correctly. Please note, since ver.0.4, modpack hosted by github. Hmmm... It looks interesting. I will try it! Nice to see some more packs. Unless I'm blind I think you forgot to include a download link. Thanks Bunsan, indeed I forgot download link, fixed. I am enjoying the pack a lot! However, I get lost and I don't know how to evolve with this expansions. Would you consider making a guide or even including the HQM mod in the pack? Thanks for the pack again! That's a great idea! It will be very useful for beginners like me. Honestly, I never heard about HQM mode before, therefore have yet no idea how it works - is it something for making goals for singleplayer? The main assumption during creating this modpack was use it for multiplayer server (currently I'm testing it on my private server, public server would be announced later). 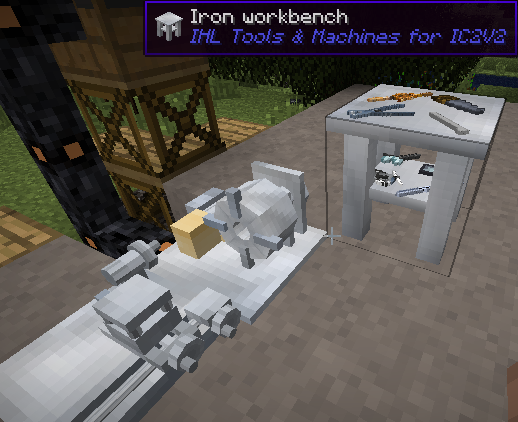 Loving the pack but those heavy machines are really difficult to get: insane amounts of iron! This seems like a more stripped down version of Terrafirmapunk. I wonder now that minecraft has made some vast changes, if current mods will update or drift on over to TFC. If TFC ever updated to 1.9 I would wonder how much free time the developers had, because that would be quite the feat. That's why we're working on TFC2, which will be for Minecraft 1.8/1.9. It's not feasible to port TFC beyond Minecraft 1.7.10, so we're just starting over. Makes sense. I found the repo so I'll just follow you on there. Version 0.2 is available for download, see first post. Simply Achievements book give some millestones and tips. FSP boilers now works fine with fresh water thanks to TFC-tweaks mod. One important note - some control keys overlap each other, for example 'M' for TFC tool mode, Mapwriter menu and Railcraft locomotive mode, check your controls settings and redefine for your needs. I absolutely love this pack! <3 TFCTech Addon by Shurgent is very interesting. It would fit perfectly into this pack. Nice, that you all had enjoy with my modpack, therefore version 3 is available, download at first page. Mob properties + Just Another Spawner provide gradation of monster difficulty depended on depth, and better rewards from drops. For example, cave skeletons have highly calcinated skulls, such skull if dropped, can be used as source for flux (by the way, flux is not a crushed limestone CaCo3, it is CaO, and in case of TFPPv3, must be produced by heating limestone-type rock in firepit or furnace). Beware of burning zombies and skeletons - they can turn into fire or pile of dirt, clay, gravel or cobblestone (pulvis es et in pulverem reverteris). Wool can be colored by soaking in decorations mod liquid dye. Unified receipts for bed and ship berth, both need silk and red/blue wool. If talking about Waila or Smart Moving, I recognize these mods as somewhat cheaty, but of course anyone can feel free to use it accordingly. I had plan to include Cart Mod, but unfortunately it is not working with TFC (game crash occurs), does anybody know similar mod with cart attachable to player or horse? I prepared next, 0.4 version of my modpack. I changed and tested in SMP environment spawn rules of hostile mobs. Aggressive mobs can be found underground, with deep-graded difficulty. At the surface, you can enjoy peaceful nights (not counting rare creepers), there are some neutral monsters such zombie pigmans or endermans, not harmful if unprovoked. Occasionally, after new moon, you can observe hordes of zombie and skeletons attacking, most zombies are weak, but some zombie warriors are dangerous and well equipped. Two night later you can again sleep well or work overnights if you wish. Normal spiders can be spotted at the top of hight trees or in mountains. Cave spiders appear only in deep underground caves. Many creatures are attracted by light. Intense light repulse them, but they will appear at the border of light and darkness. I recommend usage of 'night vision' potion for random exploration of caves, or light every corner of them if you want to work safely for longer time. BTW, I decided to push modpack into github repository, for better tracking of the changes. Link to repo and download is attached in initial post of this threat. This modpack is getting better and better Great job buddy! New 0.5 version is ready to download. I updated TFCAutomatedBellowsAddon, TFCCellarsAddon and TFCTweaker, added ModTweaker2, Foundry and customitems mods. Modtweaker2 allow me to tweak some Railcraft rolling machine recipes and unify coke ovens and blast furnaces. Foundry gives large impact into mod - it allow, with use of RF power, to melt and cast into molds any metals, including steel and black steel. Red and blue steel are not supported, this is intended (these superior alloys deserve hand-made proceeding). Thanks to the Foundry mod, all issues related with FSP crucible are now removed. Also stained glass can be produced by elegant way (mixing melt glass with dyes and casting into molds). You can also cast glass slabs, which are useful for filling detailed windows, and melt quartzite sand into clear quartz glass. Foundry brings also new mob - gun Skeleton, which is spawned by dead Enderman, or on ships at deep ocean during nighttime. Gun Skeleton is a source of some unique gun parts, which can be replicated later by foundry casting, if dropped. custom items metamod allow to add some missing items and fluids (for example TFC molten alloys), it also bring some new items itself (mc 1.8 blocks etc). It helped also to change some recipes into more realistic/believable, for example aluminum recipes mimic real Bayer and Hall–Héroult processes, sodium hydroxide needed for Bayer process is obtained from sodium carbonate produced by Leblanc process. Chromium is produced by aluminotermic processing of chromite, obtained as byproduct of crushing serpentine. TODO: add support for Rails of War Don branch mod, add more chemistry, paper from wood real process, better potions. Pool: I'm considering adding IC2 Experimental to gether with IHL Tools & Machines, first of all I need IHL for better chemistry, secondly I need IC2 EU to bring Railcraft Turbine to work, and IC2 nuclear plant is maybe also needed. Is it good idea to deal with IC2? Which IC2 items/blocks are considered OP? Hmmm... Interesting. I need to test this new version. . I only know the basics of IC2 so I don't really know which items are OP but it would be nice if you would add it into your modpack . IC 2 has minetweaker support which is really nice Also you can use TFCTech because it has hevea trees which are the same thing as the rubber trees from IC2 and it also has a really nice rubber-making procces. NIce ill try it out later, hope you have a relaxing vacation! And by the way i entocunterd a bug in my single player world and i can't join into the world anymore without it crashing. There seems to be a problem with the Gunskeleton, the game crashed after it approached me. Its not a big deal since i only played this world for about a hour, just wanted to report it. There is a hotfix: http://149.156.194.203/~mczapkie/Train/tmp/tt/download/mc/tfpp5hotfix.zip - close mc, replace files and restart. I suppose this is a very noobish question yet it frustrates me nonetheless. How does one obtain industrial hemp seeds on an existing tfc world? It is not possible to get seeds from grass, bevause there is no vanilla grass in TFC, therefore I added small chance of drop from one kind of zombie. Additionally, plant oil and plant fibres can be alternatively obtained from squeezing jute.